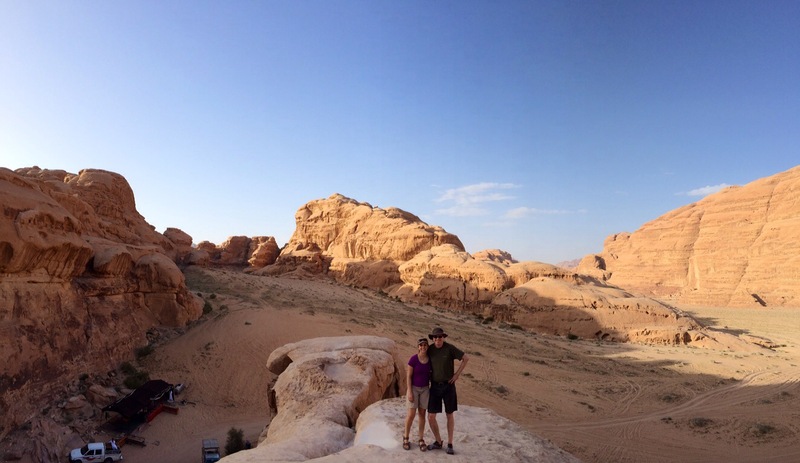 (Visit was April 8 and 9, 2014) Wadi Rum has epic scale to it. It’s the kind of desert landscape that inspires awe at every turn. However, what makes Wadi Rum so special is the unique culture and sociology of the local Bedouin people, who’ve made Wadi Rum their home for thousands of years. The people make this a very magical and memorable place on earth. In preparation for our visit, Matt and I watched Lawrence of Arabia together in snippets spanning the previous week or so. I was surprised at myself for not having seen it yet, and both the cinematography and performances lived up to the hype. It set the mood and left us excitedly anticipating our camel riding journey into this landscape. 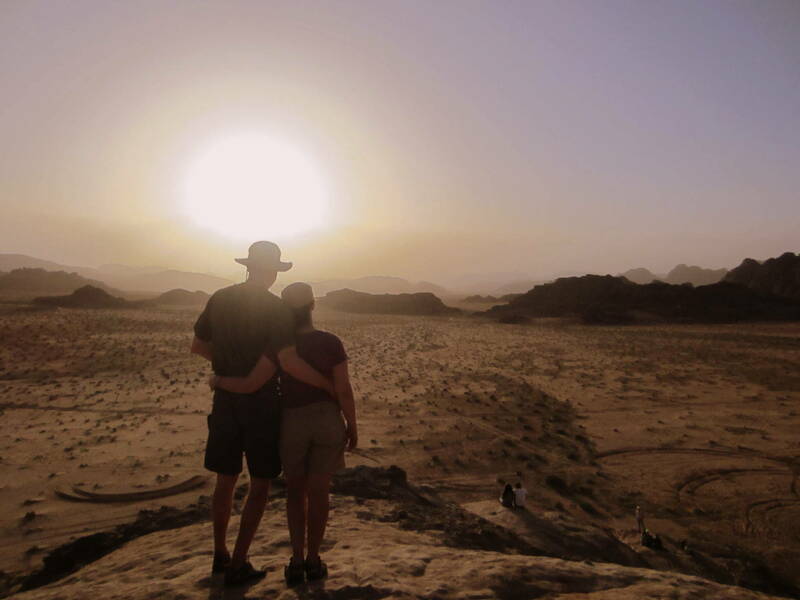 Wadi Rum is an easy 90 minute drive from Aqaba. 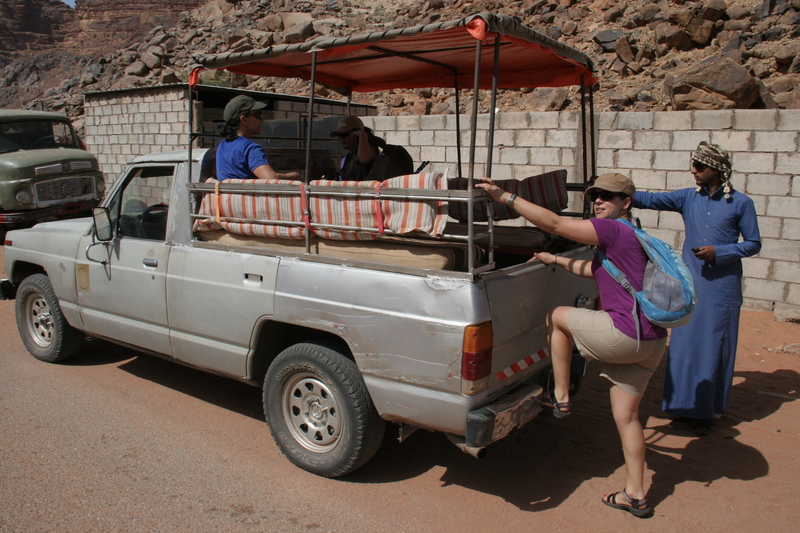 We had booked an overnight safari with Rum Stars Camp – one of the many Bedouin run camps that arrange 4 wheel drive jeep tours into the park along with an overnight under the stars stay in an authentic goat haired bedouin tent. Our group comprised Yoann, a French man living in New Caledonia, and two lovely ladies traveling together from Edmonton and LA respectively. Within minutes, it became apparent that this was going to be an exceedingly good group. We had great chemistry right away and were laughing and talking our way through introductions as we bumped up and down on our bench seats in the back of the open-air truck. Throughout the day the conversation was no-holds barred, and often sank to the ranks of lewd and vulgar. That we all giggled without any eyebrow-raising prudishness among us was really adding to the enjoyment of the scenery as our guide, Awad, showed us various viewpoints, rock formations and canyons. 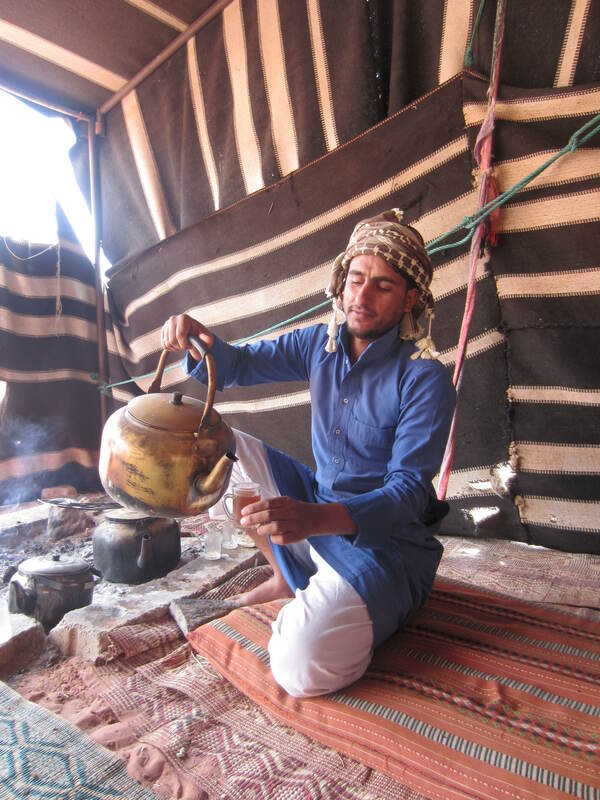 We would often stop for Bedouin tea which was delicious, infused with cardammon and very sweet. Sometimes we’d get it with camel milk which I had been anxious to finally try. The Bedouin people are extremely relaxed in their social interactions: nothing is done in a hurry or without purpose. 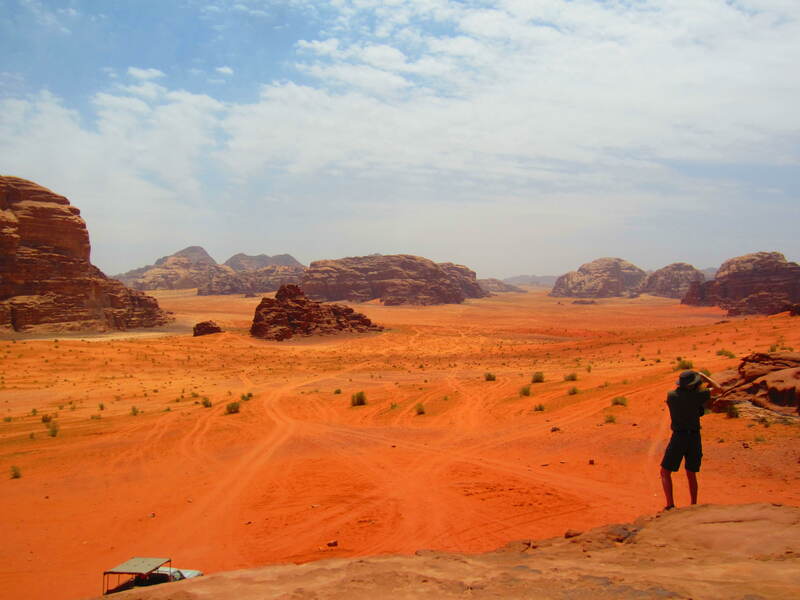 Sitting around and communing with “family” – which nearly everyone living in this section of Wadi Rum can claim to be – is a very important part of their working day. However, they are also very serious Muslims, and our lunch picnic and subsequent hike was very carefully timed so as to allow our driver a chance to turn towards Mecca and pray. 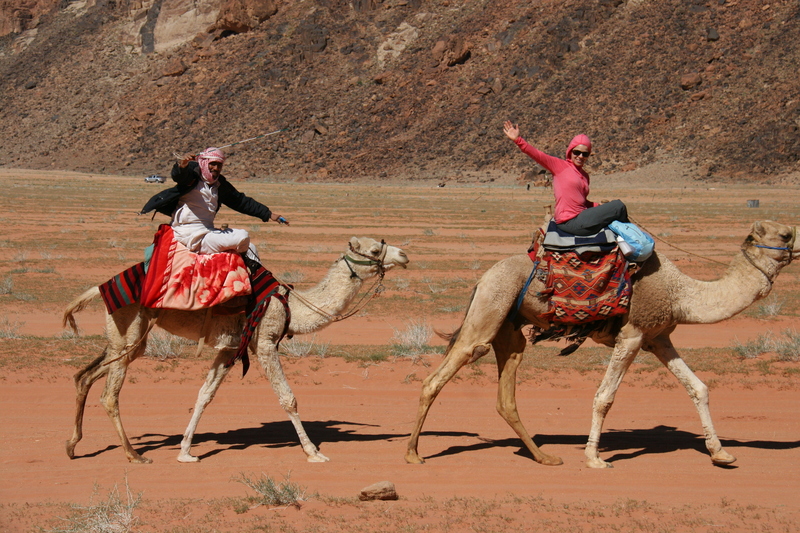 Several “in-jokes” that our group got to enjoy together made our day and a half in Wadi Rum so memorable. For example, when Matt was trying to explain to Yoann why he should ensure that he pays for a camel for himself to ride, and a camel for his guide to ride too, he helpfully added “You know, it’s like 1st class camel vs. economy camel.” I was dying. In the afternoon, our guide took us to a massive rock formation that was appropriately named “Mushroom Rock” for very obvious reasons. We were given 10 minutes to get a closer look and snap a few pictures. Towards the end of our visit to the rock, Yoann yelled out “Oh my God, you guys!! It’s a MUSHROOM ROCK!” The comedic timing of his line was brilliant. The sunset was beautiful. We climbed up high on a rock escarpment and had a view unobscured by a single man-made object for miles and miles. As the temperature dropped, I was glad for having brought my puffy jacket. I sat cozy and wrapped in Matt’s arms and life felt very good indeed. The camp itself was marvellously situated. Matt’s and my tent had 5 beds in it! I was shocked to find running water and toilets – not what I was expecting at all. Dinner was buffet style and extremely delicious. We sat with our group and grumpily eyed the other tourists, deciding that they were “The Others” like on an episode of Lost. Following dinner, the Bedouin guides answered questions about their way of life, their culture and their women. The last point was a difficult one for us Westerners to swallow as our speaker told us that women could not be tour guides, since the work is too hard, the driving is too difficult, and sometimes the trucks break down… Sigh. I looked at Matt who squeezed my hand and exhorted that I “Just keep it inside, babe”. I slept like a baby and awoke before sunrise to go wander out into the desert and watch the sun come up. It was cold and I could see our camels being geared up for our 2 hour saunter back to the park entrance. I had never been on a camel. The trickiest part is trying to stay on top as the camel rises after lowering to the ground to allow you to climb on. Once I was situated, it felt ok…especially after our guide, Ibrahim, showed me how to sit with the right leg crossed under the left. Matt and I took off on our own, tied together to Ibrahim’s camel. After about 1/2 an hour, Ibrahim untied all the camels and we were free to go at whatever pace we (or the camel!!) wanted. Being alone out there in the middle of the desert with breathtaking vistas as far as the eye could see was surreal. I felt as though I was in a movie. Pretty spectacular and something I’ll surely not soon forget.